Napoleon Bonaparte lead the French to victory and disaster and there is no doubt that his influence on the French Empire was one of the most influential and defining moments for this country. Masterfully narrated by David McCullough, this documentary goes into a good amount of detail from Bonaparte's humble beginnings in a farmhouse in Corsica to military soldier and eventually emperor of France. 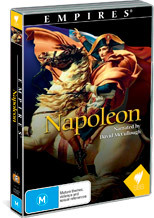 Collecting all episodes from the documentary into one accessible collection, it is ironic that Napoleon's jaded views of France, actually led him to become emperor and ignite a European revolution. Apart from emperor, the documentary gives the viewer insight into his Italian heritage and the relationship between him and Josephine. Although he lead his country to victory, he also led the country to disaster, especially with his campaign to Russia. The series finishes with his abdication and exile to Elba where Napoleon died in 1821. The re-enactments are quite impressive as is the cinematography of the series with some great re-enactments such as the historic Battle of Waterloo and both the video and audio quality nicely compliments this series. We could happily recommend this to all lovers of history, especially those of the French and it's quite interesting to see one man's rise to power and fall. It may not cover everything about this historical figure but for what it does, it's definitely a great starting point.